Healthy living is all about choices, and now it's even easier to make good choices with 400 Calories or Less with Our Best Bites. From tasty snacks to mouthwatering entrees to delicious desserts, each recipe is packed with big, bold flavors—and all under 400 calories! But maybe—if you feel like splurging—you'd like to change it up a little? Add a different protein? A side dish or two? 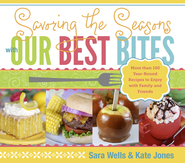 In this innovative, full-color cookbook, the girls from the award-winning website Our Best Bites have provided a variety of add-on options that puts you in control of your meals and your calories. include tips to make shopping and cooking a breeze. provide nutritional information to make healthy choices easier. are customizable so you can fix healthy dishes that your family will love, while still maintaining your calorie goals. So dig into your favorite dishes and enjoy mealtime again, knowing that your healthy lifestyle goals are in reach.